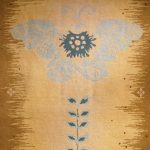 When Kathleen Olson, founder of Messenger Rugs, speaks about her company, it is clear that even the name she chose for the business reflects her love for rugs and desire to honor the weaving process. “Rugs carry lots of stories and messages from a lot of people within them,” she says. 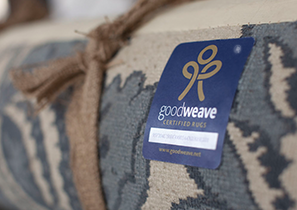 With her membership in GoodWeave®, she explains, she is now able send her own message to those same weavers by helping their children go to school. 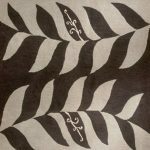 Kathleen’s interest in textiles comes from her family with its long line of Irish tailors and weavers. Her own entry into the field, however, was not immediate. 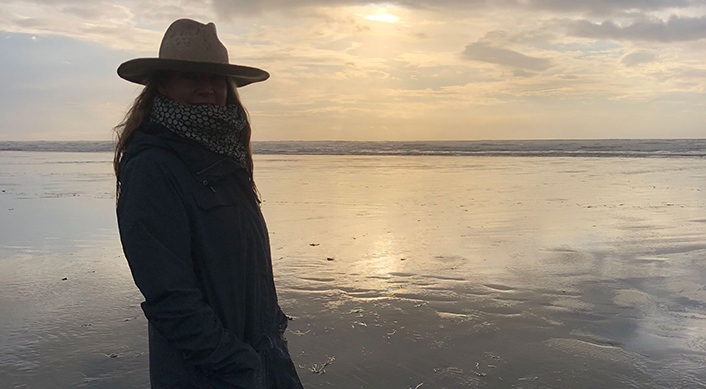 After some years working in fashion marketing and later as a graphic designer in Norway, she returned to the U.S. and finally began the serious study of textiles and as she puts it, “found rugs, or rather”, she continues, “rugs found me”. 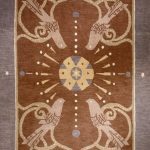 For a number of years she designed rugs for other people but at one point realized she needed to make a change. A talk she heard by iconic designer, Stephanie Odegard, powered her decision to o launch her own business. Kathleen says that her interest in yoga combined with ideas she explored in her graduate studies in mythology, shape the content of her designs. 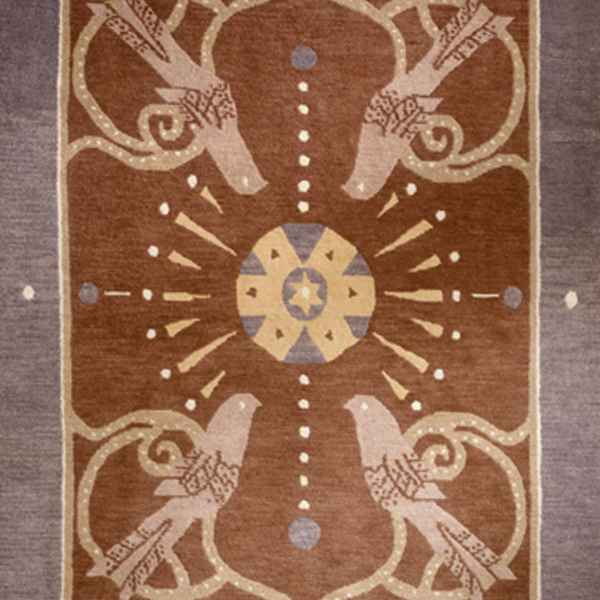 The rug motifs are inspired from images derived from cultural stories from around the world. 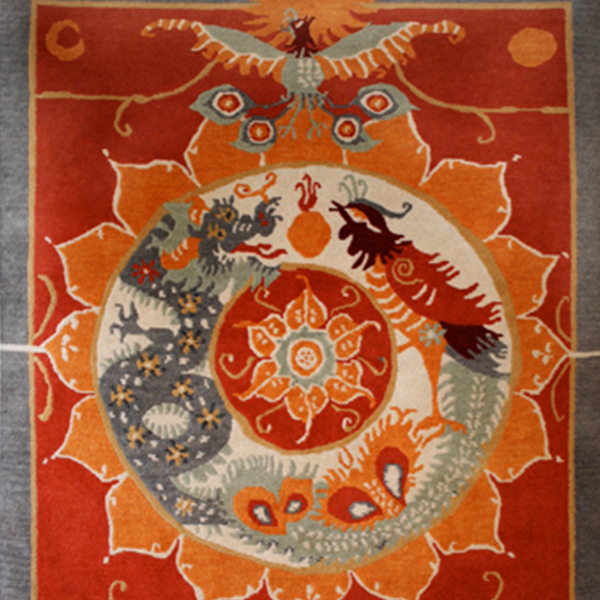 For example she points to “Phoenix”, a bright red Tibetan weave. 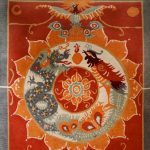 She says her fascination with the duality of good and evil in tales of the dragon and the phoenix inspired her to weave those myths together figuratively and literally. An even more complex rendering of mythic elements is in “Metamorphosis”. This rug, in pale yellow, has a turquoise vine with six leaves “growing” up the middle of the carpet. A butterfly with a lotus flower in its center emerges from the vine. The leaves, Kathleen explains, reference the six energy centers of the body, a motif and interpretation clearly appealing to the yoga and meditation demographic who buy her small rugs.